When you’re travelling Tasmania, you might notice the unusual tendency of people to stand by the side of the road, alone in the middle of the bush. There’s no public transport around; they’re not engaged in any clear form of activity. What the hell are they doing? Are they waiting for someone or something? At first it’s puzzling, even deeply concerning. But then, as you travel along Tasmania’s east coast, you realise these roadside lone wolves are onto something. Lingering in the stunning landscape – that’s not such a bad idea after all. Although most of us will be loath to abandon our vehicles, we can take a lesson from these locals. Travelling up the east coast on the Great Eastern Drive, there are so many sights worth taking a deliberate moment of stillness to appreciate. If you’re travelling from the south, the Great Eastern Drive kicks off in Orford, about one hour north-east of Hobart. This town resides by the Prosser River, blessed by the singsong of birdlife and the nautical tune of incoming and outgoing vessels. You can stretch the pins before the northern journey by walking the 2km between East Shelly and Spring Beach, taking yourself past a historical sandstone quarry; alternatively, you can trot along the Old Convict Road, constructed by convicts in the nineteenth century. 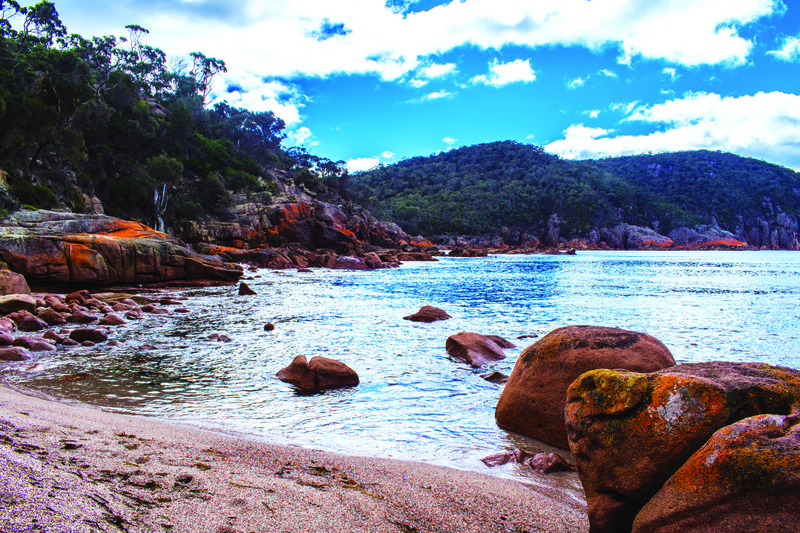 Orford and nearby Triabunna are ideal base camps from which to access Maria Island, which is a mere 30 minute ferry ride away. Yes, it’s a lot to take in; you’ve travelled to an island and are now going to an island off of that island, in an incredibly mind-boggling case of islandception. It’s worth enduring the complexity of the situation, so you can wind back the clock, unplug from electricity and experience the island’s intact convict probation station. Alternatively, you can appreciate the geological diversity presented by the natural wonders of the Painted Cliffs, Fossil Cliffs, and Bishop and Clerk (that irascible duo). 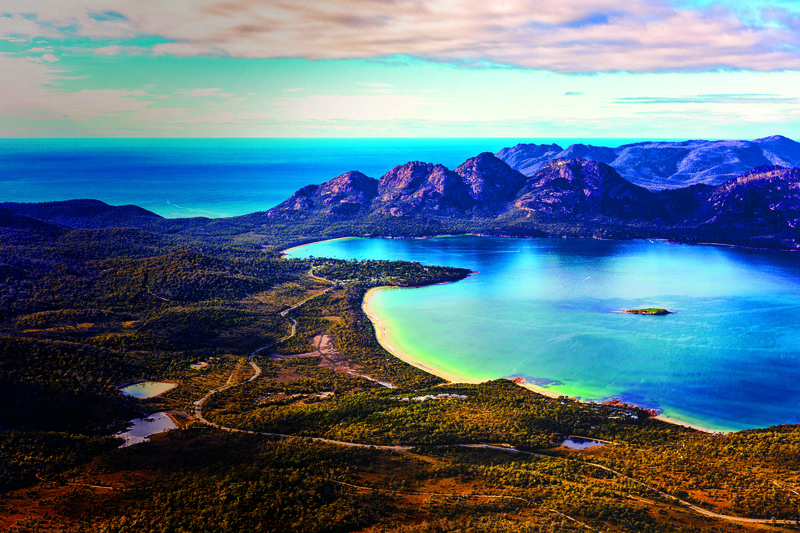 About 50km up the road from Orford, you’ll come to Swansea, a quaint town overlooking Great Oyster Bay, with the Hazards Mountains of Freycinet looming in the background. Put on a bib; it’s time to milk the taste buds for all they’re worth. After sampling the local seafood, gourmet offerings and baked goods, you’ll find yourself rocking back and forth in a corner as you attempt to wind down from the flavour overload. Never mind that the coastline drives in this area are on par with the Great Ocean Road. Swansea is actually very close to Freycinet Peninsula, as the bird flies. There’s a long finger of land pointing east towards it, but it falls tantalisingly short. Instead, the journey balloons to over 50km; you have to continue up the Tasman Highway, turning right onto Coles Bay Road. If you’re driving at night, see if you can spot tawny frogmouths. We saw two sitting on a road sign, but by the time we’d pulled over to say hello, they’d vanished into the night. 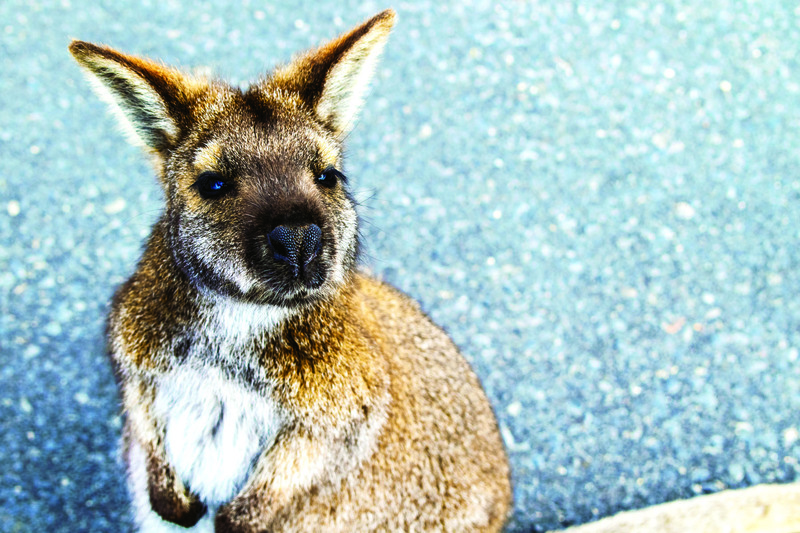 Contrast this anti-sociality with the friendly wallaby who wouldn’t leave our side at the Cape Tourville Lighthouse and you get a sense of how diverse this place really is. 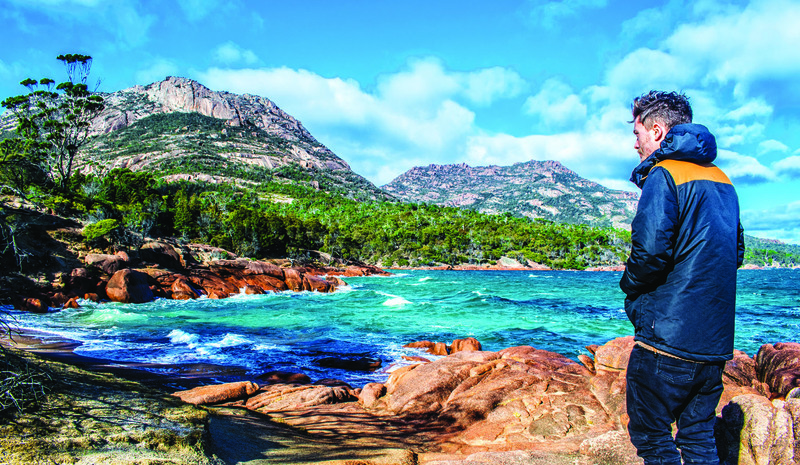 Make sure you head to the Wineglass Bay Lookout. Looking down on the bay, the name starts to make sense. Not only does the shore curve in a steady arc like the side of a wineglass, the seabed becomes deeper in a similar bend, transforming the colour of the water accordingly. This water is, in fact, as still as wine. The only problem is you can’t drink it. The sudden rise of the mountains around the bay’s perimeter round out the image. Standing at the lookout, you want to get amongst the awesome view. The good news is you can, by following the walking trail down to the bay. We missed out on this due to maintenance, which gives us an excuse to return. While you’re in the National Park, check out the aforementioned lighthouse, Honeymoon Bay and the many tours on offer (including cruises, charters and walking tours). Do be warned that the roads through this park can be narrow and windy, so take it easy with camper in tow. The next leg of the journey takes you up through Bicheno, Four Mile Creek, Falmouth, Scamander and Beaumaris. This region is known as the Surf Coast, thanks to the booming swells that occupy the surf rats all year round. Just inland of Bicheno, you’ll find the Douglas Apsley National Park, full of terrific short walks through rainforests and by waterholes. After completing the Surf Coast, you arrive at Bay of Fires. This holy place resides near St Helens, the northernmost point of the Great Eastern Drive, and it certainly fits the bill of the grand finale. 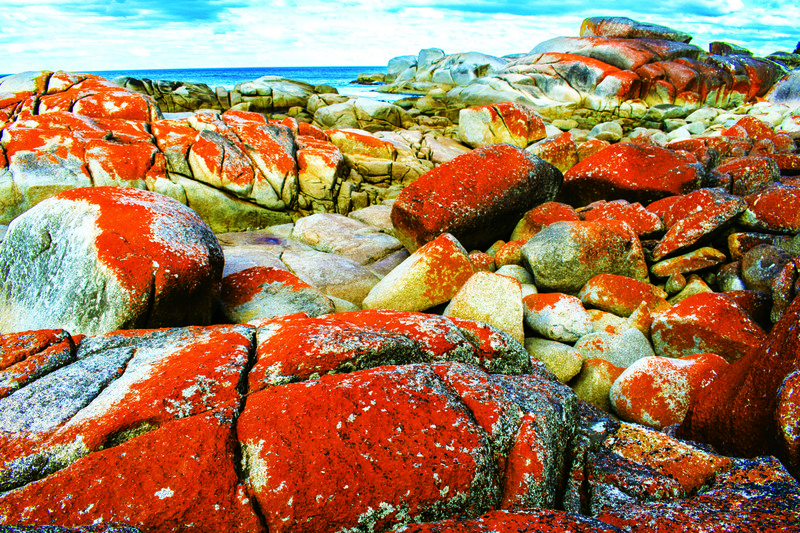 It’s a 50km stretch of coast comprised of piled orbs of granite covered in bright orange lichens. Who knew that fungus could look so good? Particularly when it’s side by side with strips of bleached white sand and unusually vibrant blue water, transparent where it’s calmer in the bays. You can walk over the rocks and escape any evidence of humanity (boats on the horizon, footprints, rubbish), gaining the sense you are the first person to discover this magical place. But indeed, people have lived here for thousands of years, with the name surprisingly not referring to the colour of the rocks, but to indigenous fires burning when explorer Captain Tobias Furneaux first saw it in 1773. Although the Bay of Fires in its entirety can be considered a destination, there are destinations within it which you’d hate to miss. Binalong Bay, the main beach, will bless your SD card with some quality snaps, or give you a chance to wet your snorkel, fishing line or budgie smugglers. Consider heading to the 37m Eddystone Point Lighthouse and the Gardens conservation area too. Tassie sounds fab. But you have to get there first. If you live in Tasmania, you should have no troubles getting your camper trailer to the starting line (which can, thanks to the invention of two-way roads, be either St Helens or Orford). However, if you are from the mainland, you do face somewhat of an uphill struggle. 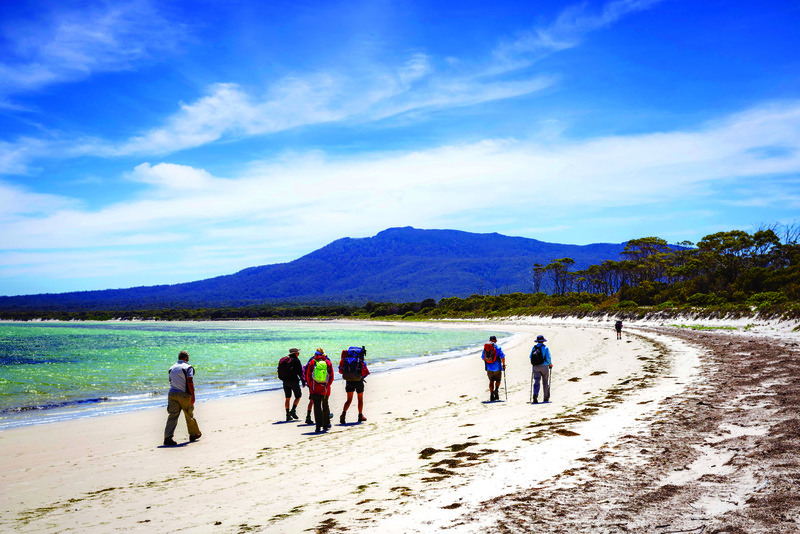 If you want to use your own camper (pre-packed with all the toys and kit you’ll use on the trip), the best option is to take the Spirit of Tasmania. This huge ferry travels from Melbourne to Devonport, a town in Tasmania’s north. Depending on your perspective, this can be an overlong and expensive journey, or it can be an opportunity to relax and experience luxury. It will cost you in the vicinity of $1,500 to $2,000, depending on your car, trailer, travelling dates and amount of travellers. This approach will save you accommodation costs once you arrive, but it will also require a fair bit of cross-country driving to make it to the Great Eastern Drive. It’s six hours from Devonport to Orford, and three hours from St Helens to Devonport. This adds up to over nine hours of driving just to get there. Never mind the preceding trek over the mainland if you’re not from Melbourne. Whereas, theoretically, you could fly into Hobart and drive an hour to Orford; and on the way out, drive two hours from St Helens to Launceston, flying home from there. All in all that would save about six hours of driving – within Tasmania alone. However, you’ll be lucky to find a camper trailer you can pick up in one of these major cities and drop off in the other. You might even struggle to hire and drop off to one city. That’s because many of the major businesses fail to see the light, only hiring out caravans, campervans and motorhomes. If you want to hire a camper trailer, you can try share sites such as Camplify and SHAREaCAMPER. Alternatively, you can make a thorough search online and see how you go; for example, online, Sunset Campers say they have a Bushmate Deluxe 4x4 camper trailer available for pick up and drop off in Devonport. Rest assured, the journey is worth these logistical headaches. Tasmania is like a mini-Australia, with the empty spaces eradicated, leaving nothing but densely packed destinations. The cost of the journey might justify a longer trip, one that covers the inland forests, waterfalls and mountain ranges too. But ultimately the coast is Tasmania’s crowning achievement.